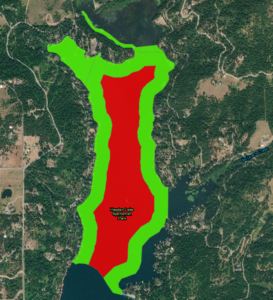 Today, with input from Kim Holzer (ISDA), Amidy Fuson (IDL), and Todd Walker (HL Lake Manager), I hope that I can address some thoughtful questions that might be tickling your brain concerning this week’s Milfoil treatment on Hayden Lake. Why is the center of the lake in this area being treated and why isn’t the center of the lake elsewhere being treated? Milfoil grows best in shallow water that is less than 20 ft deep. There, the temperature is warm, and the light penetrates to the bottom. It also needs soil that is rich in phosphorus and nitrates to fuel its growth. This describes the phase 3 treatment area perfectly – shallow and nutrient-rich – where the Milfoil growth is dense and topping out. Boats, as they motor to and from the Sportsman’s Access boat launch, are chopping up the Milfoil vines. Each piece of Milfoil cut away from its mother stock has the potential to wiggle its way to the bottom and plant itself, increasing the Milfoil population exponentially. In the deeper parts of the lake, where the Milfoil is far enough below the surface, the Milfoil growth isn’t as disruptive, this unintentional propagation of the weed doesn’t happen, and it doesn’t require treatment. Where the water is deep, in the center of the lake south of this treatment area, Milfoil can’t grow where it can’t receive the warmth and light energy from the sun that it needs for photosynthesis. Click to view full treatment map. This large-area treatment seems to be pretty far from the shore; why do we need to observe water use restrictions? To understand this, we need to back up a bit. Hayden Lake is a dynamic system. The Milfoil multiplies, even between the assessment day and the treatment day. The wind that drives debris around the lake also pushes the water around – and everything in it including bits of Milfoil and the herbicide meant to kill it. People interact with the lake in different ways, boating on it, pumping water from it, playing in it, taking their food from it. These interactions also move the water and its contents around. When planning Milfoil treatment, ISDA targets a treatment zone in anticipation of the Milfoil growth. Further, a ¼-mile buffer zone is delineated to conservatively account for the dynamics mentioned, i.e., wind, current, weather, and human interaction that could move the herbicide outside of the treatment zone. When planning weeks in advance of treatment, everyone within the buffer and treatment zones is notified so that they can make informed decisions about their water use. As the treatment day approaches, the lake will change, and the boundaries of the restricted zones can vary as well. Inside of 48 hours from treatment, regulations require that all areas within 600 feet of the treatment zone be physically posted with information about the treatment and the water-use restrictions that need to be observed. What about that area between 600 ft. and a quarter mile from the treatment zone? Those who interact with the water within this area should stay aware of that dynamic lake. Ask yourself, where is your water intake relative to the treatment zone? What factors on the day of treatment might be nudging the herbicide beyond the 600 ft. and into your area? Then make the most informed decision you can about your personal water use for the safety of you and your family. In the case of this week’s Milfoil treatment, ISDA plans this large-area treatment to be farther from the shore than the previous spot treatment. Even so, the vast majority of the shoreline around the treatment area falls within the 600 ft. restricted zone. So, though herbicide won’t be applied directly to water adjacent to your dock, follow those water restrictions! We hear conflicting messages about when we should and shouldn’t drink or use the water. When is it truly safe? Click to read the Littora (Diquat Dibromide) label. The Littora (Diquat Dibromide) label is where the buck stops in matters of regulation and the official word. The manufacturer bases their published water use restrictions on their research and experience, and they are held accountable for them. They have all the reasons in the world to get it right. And, their precautions are meant to cover all environments, all applications, and all interpretations. Is it possible that the Hayden Lake system is a little bit different than the average lake to which this herbicide is applied? ISDA’s scientists and their agents assigned to North Idaho understand the dynamics of our lake. And so they apply a little bit of cautionary sense on top of the manufacturer’s directives. For example, the label says there are no restrictions on swimming in treated areas. Never-the-less, ISDA suggests a little extra caution before playing in the water. Isn’t it reasonable to anticipate that a swimmer might open their mouth or their eyes, or may have cuts or scrapes while swimming? These in-between kinds of interactions could lead to swallowing or trapping herbicide molecules in swimmers’ bodies, even though skin-contact is OK. So, don’t swim in the water for some hours after application. Beyond ISDA’s suggestions, you can use some cautionary sense of your own. Watch the wind and avoid locations where things drift in and don’t drift out for the full three days. Those “things” are likely to include the herbicide. If you use a water containment system, like a cistern, avoid drawing treated water into the system, where the herbicide can accumulate. It’s your family’s well-being, and you get to take charge of keeping it well. To help you make informed decisions, ISDA tests the water for residual chemicals after the treatment. They lift the water restrictions when the Diquat concentration is less than 20um/L. Why can’t you just kill it all and be done with it? That is our dream. But we understand that Eurasian Milfoil is an invasive plant and is wickedly challenging to eradicate. It doesn’t just live; it thrives in the water of all the lakes in North Idaho and beyond. With our current knowledge of Milfoil, we know that to eliminate the invader we must make its environment inhospitable. Though even stronger concentrations of herbicide might do that, though there’s no guarantee, it is important to balance additional and even unintended consequences of our actions. An extreme chemical treatment runs the risk of damaging native plant species and fish habitat, and it is likely to impact the humans who drink the water and bathe or play in it. One definitive solution is the one we don’t want: drying up the lake to destroy the root-stock. Again, the additional consequences are unacceptable. 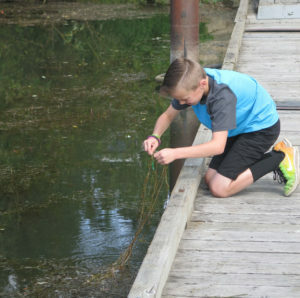 If we can’t eradicate the Milfoil, we have to resolve to manage it today and to improve our knowledge of the species and environment with an eye toward getting closer to safe removal in the future. May I treat the area around my dock or property? Can a certified applicator treat the area around my dock or property? Can you provide contact information if that is an option? Milfoil growth is a lake-wide, even a region-wide problem. Having concerned citizen-scientists out there helping to control it is a wonderful thing, making everyone’s job easier and everyone’s lake experience happier. Here’s the best piece of advice given so far: know all you can about the problem you’re trying to solve and work cooperatively with your neighbors and within the law. Remember that the lake bed or lake bottom is state property and that a permit is required to treat it. If you venture to affect your own treatment of the Milfoil, there are a few approaches that you can take. An ounce of prevention is worth a pound of cure. Milfoil propagates by self-planting broken or cut-up stems and pieces. Prevent the spread of Milfoil by motoring very slowly so as not to cut up the plants, or paddling through it into the clear water before starting your motor. Also, keep your equipment clean; don’t transport weeds from one lake or bay into another. Amidy Fuson at the Idaho Department of Lands also reminded me that what we do on our shoreline property affects what is growing in the lake. She recounted instances of dock-owners decorating their docks with ornamental plants or fertilizing their beach-front lawns, and feeding the lake-bottom while they are feeding their flowers and grass as a result. Raking and Sieving. Raking the Milfoil out of the water in your dock area is tempting, but not recommended. You will probably plant a much larger and denser patch of Milfoil than you remove. And, the little shoots that you set free are likely to drift into another part of the lake (like your neighbor’s shoreline). Install a lake-bottom mat or blanket. While not employed very often, a bottom barrier can get the job done in those close-in areas around your dock. And IDL recommends trying it before resorting to a chemical solution. Lake mats, weighted areas of mesh or woven material, are a great DIY project. They work by blocking the light needed by the bottom-life to grow. The success of a lake mat lies in snugging it right down to the lake bottom and in flipping it over every 6-10 weeks so that sediment doesn’t build up. If it does, weeds will regrow in the new fresh soil you’ve allowed to form. A 10 ft X 10 ft or smaller mat is less cumbersome to install and flip than something larger. This is a treatment for which you do need a permit from IDL. Call the Mica station at 208-769-1577 or consult the Lake Protection Act page on their website. Don’t be intimidated by the application process. Write on your application that you want a bottom barrier permit. You can mail it in with a $25 check, or head down to the Mica station and they will issue it on the spot. It’s a temporary permit, renewable each year. Hire a weed-control diver to remove Milfoil at the roots: Aquatic Weed Solutions, ACE Diving, other local dive shops. I understand that ISDA employs one to clear the most sensitive areas. It’s not as simple as yanking out the plants and hoping you get enough of the root to inhibit future growth. (That’s what I do to dandelions in my yard. And you know what happens. They regrow.) The process includes vacuuming the plant parts to prevent enhanced Milfoil growth through part-replanting, as mentioned above. On the positive side, this method is very effective and doesn’t add chemicals to the water. On the negative side, it’s not economically feasible to treat the whole lake in this way. Hire a contractor to apply an herbicide. The bottom line is that you must have a National Pollutant Discharge Elimination System (NPDES) permit to put chemicals into the water. You may acquire this permit yourself, or you may hire a certified contractor that possesses one. When ISDA’s contractor applies the herbicide to kill Milfoil, the NPDES permit specifies that they must notify residents within 600 ft of the treatment. Idaho-specific regulations extent that notification area to a quarter mile. Water users within that envelope must restrict their use of the treated water. ISDA is also required to test the water after treatment for residual herbicide and to clear water-use restrictions when the chemical concentration falls below a specified level. If you choose a chemical solution, check that your contractor is NPDES permitted and that they routinely follow this protocol. Also require your contractor to inspect the area first, to select the right herbicide tuned to the situation, and to coordinate their chemical application with the ISDA’s so that there is no inadvertent over-treatment or use of incompatible chemicals. This is for your safety and the safety of your neighbors and all lake users. Remember that you are dealing with substances that are not natural to this environment. There are consequences associated with their use. 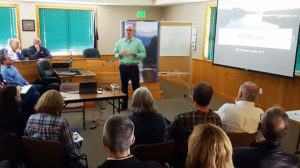 Become active in the Hayden Lake Watershed Association, not to be confused with the Hayden Lake Watershed Improvement District (HLWID) on whose behalf I write this BLOG. The Association is the community action arm of the Hayden Lake Watershed. Members of the Association are putting their heads together now to formulate a multi-pronged and strategic plan for addressing Milfoil. The Association’s Annual Meeting is Aug 16, 2018, at 6:00 at the Hayden Lake Country Club.